After the hot spring we had here in the Pacific Northwest, many expected this Summer to be a scorcher. It’s hard to believe it is July now and the weather is overcast, fairly wet and consistently cooler than April/May weather. While those who enjoy water sports may be disappointed in the Summer weather, the cooler weather is perfect for our elderly loved ones. Not only is it safer for them, it also makes it easier for them to get outside and enjoy some outdoor activities. Before we know it, Fall will be here and the rain will be around to stay. These 6 Summer activities will help your elderly loved one get the most out of this perfect Summer weather. Considering the fact that fishing does not require much movement, it is the perfect Summer-time activity for people of all ages. In fact, many fishing holes are wheelchair accessible. Water aerobics and swimming provides seniors with a great workout that builds muscles, stamina and cardio without having the high-impact effects working out on land has. Metal detecting is a great way to get outside for a leisurely activity that also doubles as good exercise. Go explore new places and who knows, you may find a treasure. 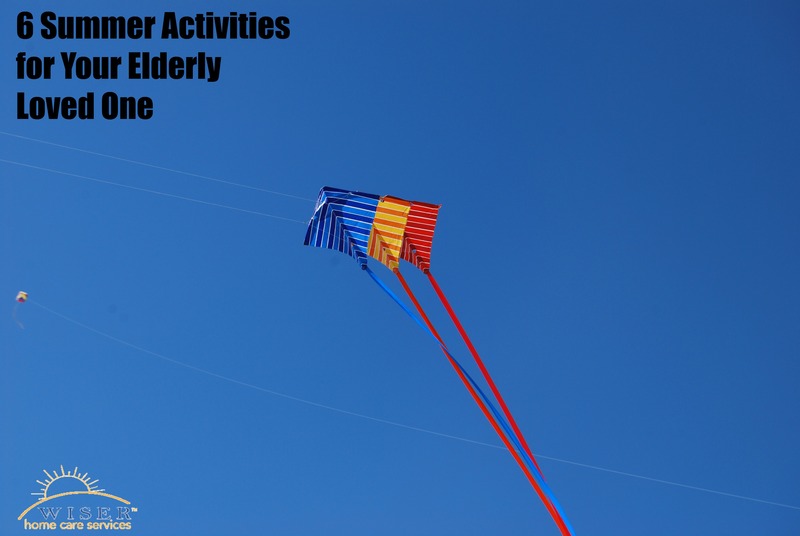 Flying kites is a great summer pastime for people of all ages. If you live near a beach, make a day of it. Enjoy the sand, sun and wind. Ok, so don’t really color your thumb green, but you know what we mean. Gardening is a great summer activity for your elderly loved one. There are plenty of crops you can plant now and sow in the fall. All that bending, pulling and moving provides a safe yet very effective workout for your loved one. Golfing is another great summer activity that doesn’t require too much physical strain. Although you may want to plan an early morning game as it can get hot on the greens later in the day. We hope these activities have inspired you to take your elderly loved one outside to enjoy this perfect Summer weather. As always, if you care for an elderly loved one and would like help developing an extensive care plan, we can help. We will be happy to answer any questions you may have.